Boat is in Denver, Colorado. This boat was bought new in 2004. Powered by twin Mercury HP 500 racing motors. 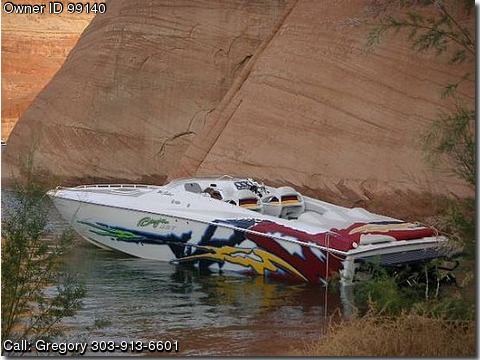 The custom air-brushed graphics come directly from Baja and are &quot;one of a kind.&quot; The engines have 580 total hours and were rebuilt by Steve Graves of Mile High Performance Marine in 2013 at 485 hours. The boat has all the racing goodies including hydraulic steering, tilt wheel, captain&#39;s call exhaust, large hydraulic K-planes, trim control on the throttles, electrically controlled front bolster seats, and Gaffrig gauges. The boat also has a new killer JL Audio stereo with 3 JL amps, 2 JL 10&quot; subs, 2 JL 7.7 component speakers, 2 JL coaxial speakers, 6 JL tweeters in the cockpit and 2 Clarion speakers in the cabin. The creature comforts in the cabin include a pressurized water system with sink in the cabin, refrigerator, depth finder, GPS, Coast Guard pack, anchor, swim platform, dual batteries, enclosed head with vac-u-flush head, holding tank for fresh and black water, and shower. The boat includes a matching navy blue Bimini top with rear extension, and side curtains, and matching cockpit and full boat covers. It resides on an aluminum triple-axle trailer with near-new tires and has a Titan electric over hydraulic brake actuator that stops the boat, trailer, and truck on a dime. This boat is a 2-owner boat and has been stored inside my heated barn the past 5 years.